On top of that, the art is sublime as the hand-painted environments and character portraits make the game feel like you’re living in an illustrated children’s fantasy book. The story is set in 1895 Austria when a duke’s daughter, Aurora, dies of an illness, only to awaken in the dream world of Lemuria. But Child of Light reverses the trope of the sleeping beauty waiting for a prince to rescue her. Rather, once Aurora falls in an eternal slumber, she takes matters into her own hands, driven to rescue her father and save the kingdom. Accompanied by what may be the most useful companion in any RPG, a firefly called Igniculus, you slowly began to traverse the land borne of reveries and are granted the gift of flight by the Lady of the Forest. 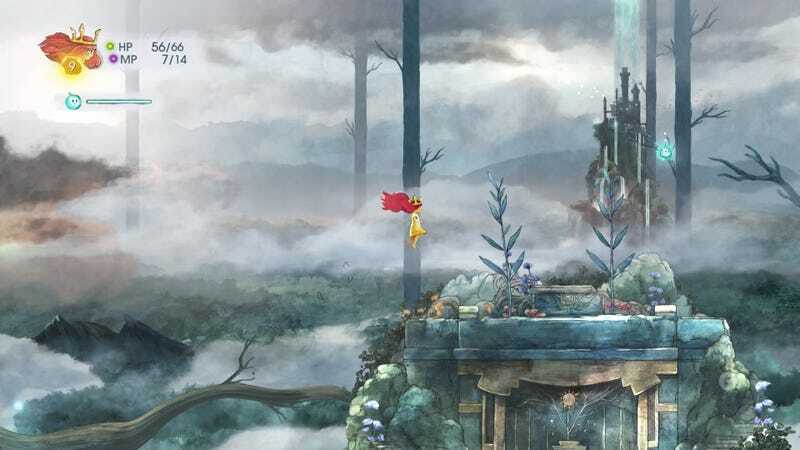 Flight is breathtaking in Child of Light and feels fluid and natural. It’s as though you’re flying through a series of paintings. It amazes me how seamlessly the beauty of the environments is uncovered through the joy of exploration. I felt like I was in an aerial ballet, twirling through the sky, even cautiously pedaling Aurora’s feet when I descended too rapidly. There’s a vibrant elegance to the physics that makes the experience feel magical (Lead Programmer Brie Code and her team did as an incredible job). But much like those old fantasy picture books, they’re a lot darker than we tend to remember. Child of Light mixes the fantastic with the ominous in the form of a villainess, The Queen of the Night, Umbra. She has stolen the sun, the stars, and the moon from Lemura. As a result, you can see the decay rotting away at many of the environments. Parts of the land are desiccated and desperate, thorny patches choking the life out of the grand trees. The melancholy music highlights the consequences of stolen light. The developers at Ubisoft have cited Hayao Miyazaki and Yoshitaka Amano as inspirations, and the tone, from the story to the canvas of the palettes, seems heavily inspired by children’s books. But you’re not just constrained to the page. You can wander into all the nooks and corners, uncovering secrets and hidden corridors. You’re also rewarded for going off the beaten path with treasure, oculi, and useful items. All the different areas of Lemuria are distinctive and whimsical, whether it’s the bustling mouse-driven Wall Street in the form of Populi, or the fiery chasms of the innards of the giant, Magna, bound up in spider webs. The elements play a key role, like the fierce wind at the floating islands near the Temple of the Moon, the smooth breeze near the towering windmills on the Plains of Rambert, and the watery tunnels underneath the Cynbel Sea. Child of Light is essentially RPG battle perfection. The fights have a continually running meter that is reminiscent of a favorite JRPG of mine, Grandia, mixing real-time battles with a strategic turn-based system. This isn’t a game you can just forcibly mash your way through. You have to take into account elemental weaknesses as well as buffs like “unstoppable” and “haste” (the former makes you impervious to metered setbacks while the latter speeds you up). Even though you have multiple party members, you can only use two in battle. That’s where the ability to swap between members at any time, as in Final Fantasy X, is essential as different stages of the battles necessitate different team members. The skill system seems to take a page out of the latter’s sphere grid with a chain/tree you follow to power up your characters. There’s also a crafting system using oculi to meld stronger gems that give your characters extra attributes. As much as I loved the other aspects of Child of Light, my favorite part was the co-op because it made it so much fun to play through with my wife, Angela. She played as Aurora and whichever companion was with her in battle (most of the times, the magician, Finn, whose grasp of elemental magic is invaluable). I controlled the firefly/wisp, Igniculus. Igniculus can change the tide of battle with a few simple, but important, tactics. He has the ability to heal party members, delay enemies, and charge up magic spells. As the meter is always running, Igniculus can hold up an enemy just enough for Aurora and her companions to overtake them, then knock them back in the meter. The battle priorities often caused us to clash and it felt like part of a real time experience. “Slow the other wraith. Heal me! No no, let him go so I can knock him back! Grab the orbs from that flower to recharge!” We would often strategize about the battle order, using Aurora’s light spells against dark enemies, Golem’s physical attacks against those resistant to magic, and careful blocking techniques by Igniculus to make sure the timing lined up. It made grinding intense, but collaborative, and never dreary, a fault many JRPGs are guilty of. Every character that joins you has a backstory and some goal they hope to achieve. They speak entirely in rhythms like the poetic legends of old. There’s Óengus, a part of the Kategida-clan that protects the Forgotten Tower, but were badly defeated by Queen Umbra. In exchange for the lives of his clan, he betrayed the others and agreed to serve the queen. He joins Aurora and is a brutal fighter, even though he is shunned by his other clans members. There’s the depressed clown, Tristis, who was fired from the traveling circus because he wasn’t funny enough. Once he reunites with his sister, he finds meaning in their mission against Umbra and becomes one of the best characters to support your party. Norah is Aurora’s sister, a thoughtful companion whose very presence delights Aurora, until matters take a sinister twist later on. Every time a new character joins and enters into battle, the party members they fight with make a friendly verbal exchange, shedding new insight into both. Almost every battle results in one of the characters leveling up, giving an immediacy to their evolution. I always felt like my party was getting better. Child of Light is a living fable, a new type of fairy tale where we not only heed the warnings of the past, but take an active part in shaping them. The developers have called it a love letter to JRPGs. And while it is that, it also weaves together its own legacy to give birth to something very original. There’s aren’t many experiences that feel as sublime as floating through the dream world of Lemuria, lost in the painted environments that feel so vibrant and alive, godrays beaming through the dark fog of a sunless land. If all my dreams were like this, I’d never want to wake up.